To prevent future harm, the new instrument categorically prohibits the use, production, stockpiling, transfer, and other activities involving nuclear weapons. It also requires countries that have joined the treaty to address the consequences of nuclear weapon use and testing – in particular by assisting victims and remediating environmental contamination. The milestone treaty significantly advances the expanding body of “humanitarian disarmament” law, which aims to end the human suffering caused by such weapons. All three of the so-called weapons of mass destruction are now prohibited: chemical weapons, biological weapons, and nuclear weapons. The new Treaty on the Prohibition of Nuclear Weapons contains humanitarian and disarmament provisions inspired by the 1997 Mine Ban Treaty and 2008 Convention on Cluster Munitions. 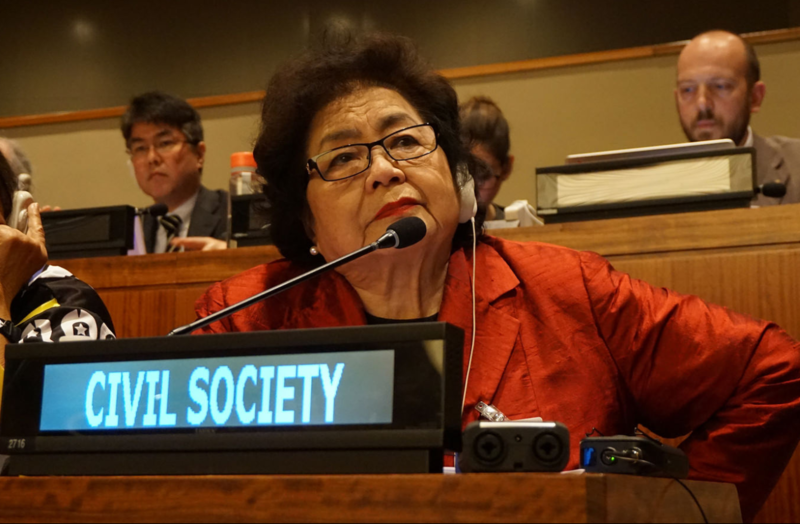 Under the Treaty on the Prohibition of Nuclear Weapons, nations must provide adequate assistance to all victims of the use and testing of nuclear weapons, including medical care, rehabilitation, and psychological support. The preamble acknowledges the harm suffered as a result from nuclear weapons, including the disproportionate impacts on indigenous peoples as well as women and girls. None of the nine countries that possess nuclear weapons participated in the process to establish the convention, but that doesn’t mean it won’t have a significant impact. The treaty provides a framework for the elimination of an inhumane and invariably indiscriminate weapon that causes unacceptable harm. It stigmatizes nuclear weapons and provides an additional form of pressure on nuclear states to take more aggressive steps to reduce and eventually eliminate their stocks of nuclear weapons. Following a key tenet of humanitarian disarmament, the treaty is the product of a collective effort by a partnership of like-minded countries, United Nations agencies, the International Committee of the Red Cross, and the International Campaign to Abolish Nuclear Weapons. It is the result of a process that first brought these states and actors together in Oslo, Norway in March 2013 to discuss how to tackle the catastrophic humanitarian consequences of testing and using nuclear weapons. Later that year the Norwegian government changed, and so did its support for the process that it had started as it quietly withdrew from the initiative. Other countries stepped up their support. In 2014, Mexico convened 140 nations to continue the process in Nayarit in February while Austria followed with a conference in Vienna in December. At the end of 2016, 113 countries voted in favor of a UNGA resolution to initiate the negotiations in conferences in March and July 2017. A core group of six nations –Austria, Brazil, Ireland, Mexico, Nigeria and South Africa–submitted the resolution to initiate the negotiations in 2017. Costa Rica’s Ambassador Elayne Whyte Gomez served as president of the negotiations. The treaty will open for signature in New York on 20 September. It will enter into force 90 days after the fiftieth instrument of ratification, acceptance, approval or accession has been deposited.